Smudge is the kind of cat that can be depicted by the phrase “scaredy cat.” When he isn’t spending his time sleeping on decadent fuzzy blankets, he is usually scared. Ok, let’s be fair; he is only sometimes scared. But that’s fairly frequently. For example, I think he may not have liked me for, oh, 3 years or so because I talk too loud sometimes and may get overly excited about many seemingly insignificant things (which can happen quiet often) which leads to large-scale movements and the before mentioned loudness. 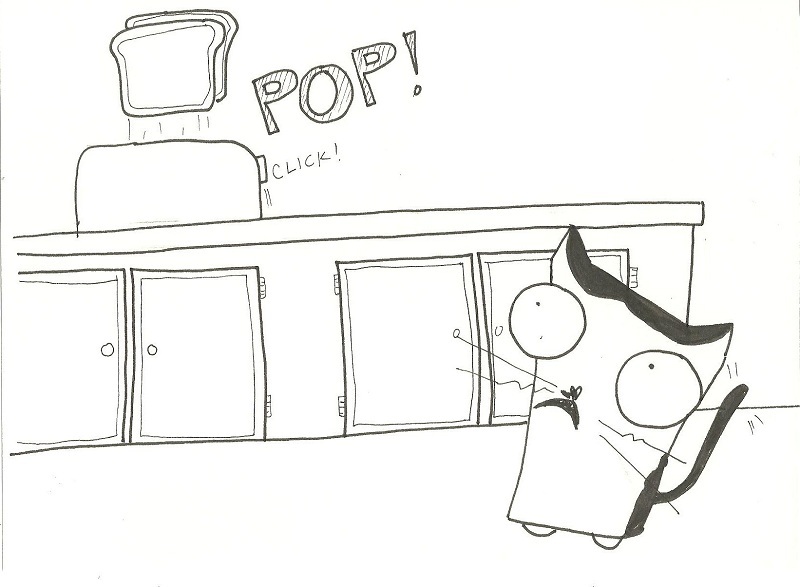 This cattoon was inspired when I was apparently startling Smudge while Adam was holding him and then he became even more startled once the toaster popped up the toast. Moral of the story: Toasters are scary and so am I. Be careful answering this question. I’ve got a scaredy cat too. If my husband walks too forcefully or talks too loudly Zé shoots off and hides in his box. It takes him ages to calm down and come out again – he really knows how to make my husband feel bad! The toaster, plastic bags, my feet under the covers, walking too hard around the house and any stranger that comes to the door. Yes…she can smell a stranger before they come into the house! I LOVE, LOVE, LOVE your blog – it gives me such a good laugh after a hard day at work!